The expression of gratitude has been show to lead to increased happiness. Gratitude has been shown to improve health, help to better handle adversity, increase enjoyment of positive experiences, and build strong relationships. Have you ever made a big purchase, especially one that required a lot of help from a sales person, and received a note after? That experience sticks in your mind. A lot of large companies will send you loyalty points, or discounts after you purchase, but a less sales-oriented message is more memorable. Saying thank you to your clients lets them know they are valued. Sending an authentic note makes you seem more approachable and stand out in the customer’s memory. By writing a thank you after a sale or interaction, you give your customer a more valuable and memorable experience. A great way to express your gratitude is by sending a gift. 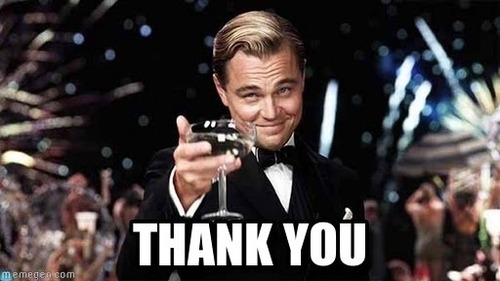 You can go the usual route with wine, flowers, or a company pen, but to really make an impact with your thank you, refer to previous conversations. After an important interaction with a client, make notes on what you discussed. Mark down important information they may have mentioned, and later use what you recorded to come up with a way to thank your client in the form of a gift. This allows you to give a personalized gift without having to stress about remembering off the top of your head something unique they mentioned. Did you discuss a book they have been meaning to read? Send a copy with your thank you note. This will show that you paid attention to the conversation. When they read the book they will be reminded of you, and when they finish the book there is a reason for them to contact you. A charitable donation is a great way to give back and show you care. If you discussed a favorite charity of theirs, make a donation in their name. After you make a donation, send them a card or forward the information on your donation. If they mentioned a type of coffee, or a favorite restaurant you can send them a gift card. Many gift cards can be sent virtually, but a gift card with a hand written note will be more memorable for your client. Also with a physical gift card, especially one you write on, you will come to mind when the customer goes to use it. If your mother was anything like mine, as soon as you got home after receiving a gift the tedium of thank you notes began. As much as I hated them as a child, they taught me a valuable skill and also I gained an appreciation for receiving a hand written note. Great thank you notes have a format to them. You should mention that you appreciate their time, reference what they did for you, explain anything that you might have sent along with the note, then thank them again before you sign. A hand written a thank you note proves that you took the time and made an effort to concentrate on the client. It shows that you made a conscious effort to thank them rather than send a pre-made note that is done as a weak gesture rather than a relationship-building tool. A hand written note adds a flair of authenticity. When you sign your name at the end you become more than just your company. The note develops into something more personal and less mechanical than an automated note. Another thank you gift would be one that keeps you top of mind. This type of gift reminds the customer of you when they use your gift. These presents are tangible, useful things with thought behind them. If you are conscious of their lifestyle you can tailor your gift around what is important to them. For example, if you want to thank a clean shaven guy consider sending them a subscription for the Dollar Shave Club. This way they will be reminded of you every morning. If this seems a bit too personal, then check out John Hall’s list of recommendations for some other great subscription options. Some subscriptions can get pretty pricy, so watch out that you don’t get stuck a bill larger than you were expecting. If you want to personalize a more classic gift, then write a thank you note directly on a bottle of wine. Then, when they got to drink the wine, they will think of you. If you receive a referral, lead, partnership, or job from someone, let them know you appreciate the connection and that you have reached out to the other contact. This conveys to them that you are grateful for the reference and did not leave them hanging. The sooner you follow up with a thank you, the more relevant you will be in their mind. Your expression of gratitude will also be more appreciated if you do it in a timely manor rather than waiting. A good way to show your appreciation in an unexpected way for someone you worked with is to reach out their boss. Not only are you thanking them, but you also put them in a good light with their superior. We readily complain about what bothers us, but rarely offer positive comments. Along with putting someone in a good light, managers who thank their employees tend to see higher motivation and productivity. Not all of your signs of gratitude have to be grand gestures. A simple tweet about their company or how they have helped you, favoriting a tweet or linking a Facebook post are small signs of appreciation. Also, by tweeting at them, you are giving your client more publicity and more attention for their post. You can also help improve their LinkedIn profile as a sign of appreciation. Writing a referral or endorse them for a valuable skill they possess improves their profile with little effort from you. Showing your gratitude to your clients is a great way to add authenticity to your brand. Not only will expressing gratitude add to your overall happiness, but it will also make your client feel more appreciated and willing to do business with you again.